Exciting opportunity to join a growing and innovative tech business in Sheffield as a Front-End Developer developing solutions with a cutting edge FinTech business. A generous salary of up to £45,000, strong opportunities for progression, and exceptional culture, and great overall benefits. You will be working on the front end of the business’ leading solutions. We are looking for a Front-End Developer to join this front-end and design team within an established tech business. This business uses advanced technology to provide customers cutting edge solutions that are changing the finance and banking space. * Develop front end solutions for specialised bespoke platforms. So what experience do you need? This is an exciting opportunity to join a growing business and have your technical skills valued and opinion listened to. Working in an environment of trust and flexibility you will have plenty of opportunities to progress professionally and technically. If this sounds like just the type of Front-End challenge you're looking for, then we'd love to hear from you! 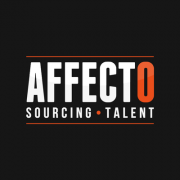 Affecto Recruitment Ltd is an IT Recruitment Consultancy and specialises in Software Engineers, Front-End Developers, Android and iOS Developers, Infrastructure Engineers, Test Analysts, Project Managers, Business Analysts, Database Administrators, Data Analysts, MI Analysts, BI Analysts and Embedded Software Engineers with a vast range of clients UK wide but predominantly South Yorkshire, West Yorkshire, East Yorkshire and Nottinghamshire.